Factropolis -- A Fun Fact Every Day! 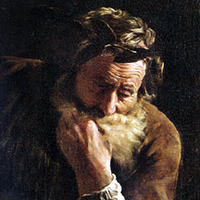 : Archimedes endured a tragic fate at the hands of drunken Roman soldiers. After forcing him to cut off and eat his own nose, they boiled him in oil. Archimedes endured a tragic fate at the hands of drunken Roman soldiers. After forcing him to cut off and eat his own nose, they boiled him in oil. Yes, most people think that "Eureka!" means "I have found it!" In reality, it means "Oh my god! My nose! You cut off my farking nose!" Ancient Greek was an efficient language. I thought he was beheaded by a soldier as he begged them not to disturb his scrawl in the sand. xetheare, you're correct, or at least that story is the only one remaining in the documentary record, but it may be apocryphal. Wherever this site got this claim from, it could never be considered a fact, considering no one documenting the taking of Syracuse ever saw this happen. But it's par for the course for this site. Watch the third installment of our award-winning ad campaign! It's currently airing on network and basic cable stations in the U.S. and U.K.
Factropolis is an association of teachers, historians, scientists and researchers dedicated to eliminating the gaps in public knowledge. We dig up forgotten trivia, right historical wrongs, answer reader questions and have tons of fun! NEW! Just copy this code and embed it in your website's HTML. Every day, a new fact will be displayed on your site automatically! All of our facts are scrutinized by a team of highly qualified editors who are passionate about obscure trivia. If so, send your obscure trivia to Factropolis. Our editors will check your submission for accuracy. If it's an authentic, obscure and interesting fact, we may add it to our library (and credit you, of course)!